I find it rather fitting that the line for the Wizarding World of Harry Potter at Universal Orlando took us through the Jurassic Park attraction. After experiencing the new Harry Potter attraction, I was reminded of a quote from Jurassic Park. John Hammond: All major theme parks have had delays. When they opened Disneyland in 1956, nothing worked! Dr. Ian Malcolm: But, John. If the Pirates of the Caribbean breaks down, the pirates don’t eat the tourists. Although we anticipated long wait times, my family and I were incredibly disappointed with our Universal Orlando parks experience. 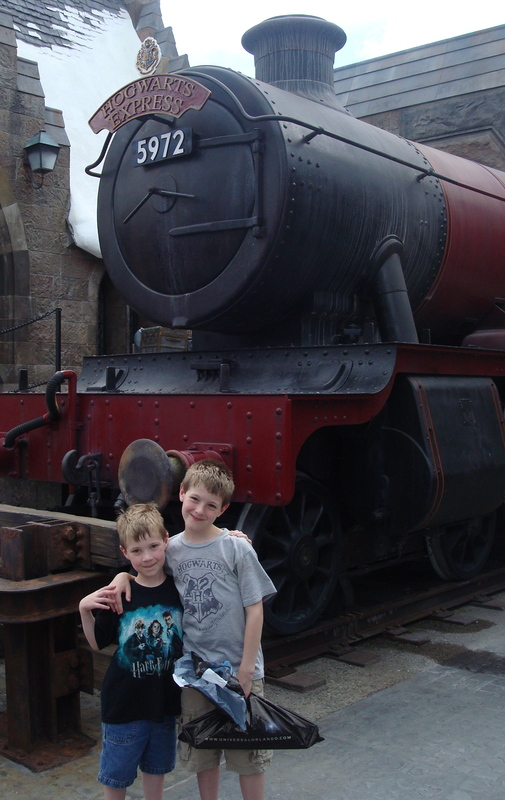 We’ve been planning this trip since we first heard that the Wizarding World of Harry Potter would be built. We anxiously awaited the opening date so we could book our trip only to have to reschedule all of our travel plans and time off from work because the opening date was pushed back. I completely understand that delays happen but I fully assumed that the new date would have allowed the park staff to plan for and manage the large crowds that awaited the opening. I was wrong. 1. They built an incredibly realistic looking Hogwarts Castle and Hogsmeade Village. Everything is to scale so the village feels just like it does in the movies. 2. The video screens that they use for the portraits in the hallways really do look like paintings. 3. I liked that the Hogwarts Express was there as a photo opportunity…but it’s also a miss since you couldn’t ride it around the park. 4. Those that were the first in line raved about the Butterbeer. The people I spoke with said it tasted just like butterscotch ice cream and was delicious and smooth. Look at the Strike Out section for additional thoughts. 5. There were a few characters in costume (Durmstrang and Beauxbatons students) but I’ll admit I thought I would see more. Wow! There were so many different areas where we were disappointed. 1. I mentioned the lack of transportation on the Hogwarts Express; they also could have used the lake in the middle of the park and created a “first year student” boat ride from the entrance of the park to the Wizarding World but that is more of a like-to-have than a true miss. 2. A real miss was in the expectations of the experience. The Super Bowl ad for the park showed people walking through the courtyard of Hogwarts Castle and into the Great Hall, yet that wasn’t an option. In fact, it wasn’t even possible to get up to the castle. 3. While standing in line for the Forbidden Journey, there was an announcement that they ride broke down and they were working to repair it. After 2 hours, we were finally able to get on the ride (and fortunately nobody was eaten). 4. They really dropped the ball on some of the features they had for the line queue for the Harry Potter and the Forbidden Journey ride. The queue takes you through Professor Sprouts’ greenhouse and they have some mandrakes…but they don’t scream (even the Harry Potter Exhibition at the Chicago Museum of Science & Industry had screaming mandrakes). The statue that leads the way to Dumbledore’s office is there, but it doesn’t rotate and move up to create a staircase. 5. The videos that play on the portraits in the hallways and in the Defense Against the Dark Arts classroom are too short for the line queue. Unfortunately you have to hear the same conversations over and over while you wait for the line to move. This is one of those areas where they could have really set themselves apart…if the portraits would have been real actors in front of a camera they could have truly interacted with the crowd rather than using a taped message. Disney does something with live audience interaction with their Monster’s Inc. Laugh Floor and Turtle Talk with Crush attractions that would have served as good models. 1. Crowd control. Orderly conduct at the park was completely non-existent. When we arrived at Universal Orlando, we followed the signage and audio messages “Harry Potter to your right” only to get to the entrance of the attraction and discover that it was now an exit only. There was absolutely no staff directing traffic. By the time we worked our way back around to the entrance of Universal Orlando, we were in a line that stretched completely around the park. Don’t get me wrong, I’m fine with standing in lines. The attraction is brand new with a lot of enthusiastic followers so to wait 2 1/2 hours to get into the park was expected. What wasn’t expected was the chaos at the entrance to the Forbidden Journey because of the lack of staff leading up to the ride explaining that bags were not allowed until you were already past the lockers. This caused people to turn around and push back against the people coming in to try to make it back to the lockers. Then, in Hogsmeade Village you couldn’t tell where the lines were forming for each of the shops, the Butterbeer, the concession cart, etc. It was just a jumbled mess. I understand the park was full, but they easily could have handed out tickets to each area with a time to enter and control the crowd better. I expected a much better experience for the cost of the trip. 2. Food (or lack thereof). The Three Broomsticks was the only place to get food within the Wizarding World. If you could find the start of the line, you were still looking at a 3 hour wait to get in. And they didn’t take reservations so even if you’re the type of person to plan ahead, you’re out of luck. There were two carts selling beverages (water and pumpkin juice) and one of those carts also sold some fruit cups. Although refreshing on a hot day (and I do like the fruit choice over ice cream), it wasn’t very filling. Some park employees suggested finding food in the other attractions of Universal Orlando…apparently unaware that if you left the Wizarding World, you were going to have to get back in line to re-enter. 3. Running out of Supplies. Unfortunately, the only way to get any information about what was happening at the park was from word of mouth from other park attendees. We were going to get into the line for Olivander’s Wand Shop (3 hour wait), but overheard people coming out saying they ran out of Hermione’s wand, Sirius Black’s wand and others so we didn’t see the point in waiting in that line only to be disappointed once we got into the shop. We also would have bought some Butterbeer, but they ran out of the collector’s mugs they sold it in so spending $12 seemed a bit extreme for a paper cup. Finally, the cart with the fruit cups ran out of forks and the staff didn’t see the issue with eating the fruit with your fingers. The advertising implied that we would be able to immerse ourselves in the Harry Potter experience. Unfortunately all we were able to do was stand in a line and look at it from afar. We definitely felt it wasn’t worth the expense. I will give the Guest Services department credit, though. As we were leaving the park, I shared my concerns about the quality of the experience and they extended our tickets to be able to come back at a later date when the attraction wouldn’t be quite as busy. So my recommendation for you is to wait until Universal has a chance to work out some of the kinks before you invest in this Harry Potter experience.